Elizabeth II, born April 21, 1926, is the eldest daughter of George VI and Elizabeth Bowes-Lyon. She married Philip Mountbatten, a distant cousin, in 1947; the pair have four children: Charles, Prince of Wales, Anne, Andrew and Edward. She has reigned for forty-six years, and appears capable of remaining on the throne for quite some time. Monarchy, as an institution in Europe, all but disappeared during the two World Wars: a scant ten monarchs remain today, seven of which have familial ties to England. 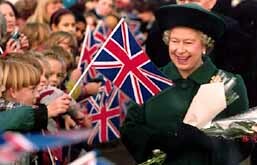 Elizabeth is, by far, the best known of these, and is the most widely traveled Head of State in the world. 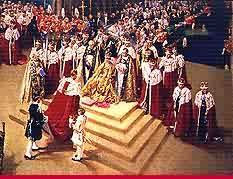 Her ascension was accompanied by constitutional innovation; each independent, self-governing country proclaimed Elizabeth, Queen of their individual state. She approves of the transformation from Empire to Commonwealth, describing the change as a "beneficial and civilized metamorphosis." The indivisibility of the crown was formally abandoned by statute in 1953, and "Head of the Commonwealth" was added to the long list of royal titles which she possesses. Elizabeth's travels have won the adulation of her subjects; she is greeted with honest enthusiasm and warm regard with each visit abroad. 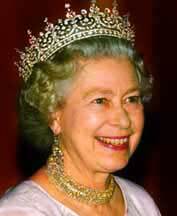 She has been the master link in a chain of unity forged among the various countries within the Commonwealth. Hence, the monarchy, as well as the Empire, has evolved - what once was the image of absolute power is now a symbol of fraternity. Elizabeth has managed to maintain a division between her public and private life. She is the first monarch to send her children to boarding schools in order to remove them from the ever-probing media. She has a strong sense of duty and diligence and dispatches her queenly business with great candor, efficiency and dignity. Her knowledge of current situations and trends is uncannily up to date, often to the embarrassment of her Prime Ministers. Harold Wilson, upon his retirement, remarked, "I shall certainly advise my successor to do his homework before his audience." Churchill, who had served four monarchs, was impressed and delighted by her knowledge and wit. She possesses a sense of humor rarely exhibited in public where a dignified presence is her goal. 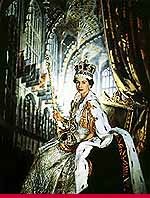 The Coronation of Her Majesty Queen Elizabeth II in the Abbey Church of St. Peter, Westminster, on Tuesday, the second day of June, 1953. The Bible to be brought.